What is bhakti? Prostrating yourself before the gods to ask for a favour, again and again? Or taking arduous pilgrimages only to come back home to your misery and sufferings? Can bhakti mean devotion to something or someone for purely self-less reasons? Bhakti could be less and less of yourself and more and more of what you are devoted to – a process of peeling off layers and boundaries of ego that we create with every breath. It could also be a conscious process of “undoing” yourself that culminates in a unison with whatever you’re devoted to. I think of Mira bai, who devoted her lifetime to Krishna bhakti and eventually disappeared one fine morning in Gujarat, where she spent a night at a Krishna temple. Legend has it that she “merged” herself with the idol of Krishna in the shrine. When I think of the Rajasthan-born bhakti poet, I also think of Prabha Atre, one of India’s highly revered Hindustani classical music vocalists. Thumri “mai bairagan” simmers with bhakti ras. It humbles you and gently brings you back to the earth, so to speak. The song is Mira’s plea to Rana ji, probably the king she was married to, that she will be a bairagan and unite with her Hari, Krishna. When I listen to this song, and it’s mostly on repeat mode, I imagine Atre sitting in a barren courtyard with her tanpura, immersed in Krishna bhakti. In her unwavering invocation of Mira and her lord, Atre becomes Mira. Her voice embodies the power that bhakti possesses. You forget yourself. The recital uplifts you to a space that does not belong to you and yet somehow you feel treading into an unknown territory. It is intangible but it engulfs you and you cannot describe it. 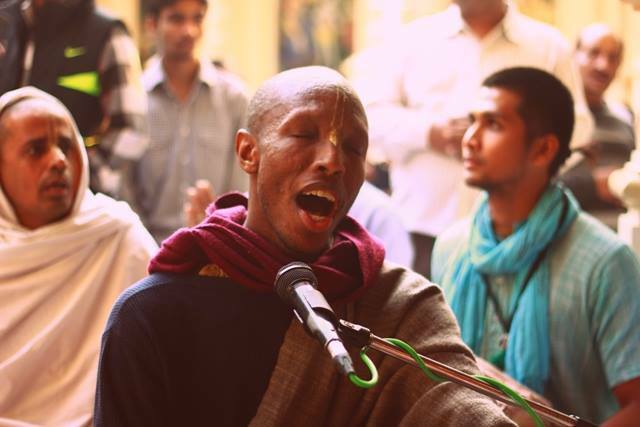 Maybe this is bhakti and that is precisely what Atre intended to do in this thumri – bhakti. Let me end this post by sharing two photos from a recent visit to Vrindavan, where Krishna is believed to have spent his childhood. The first was shot at the ISKCON temple, where a devotee chanted “Hare Rama Hare Krishna”. 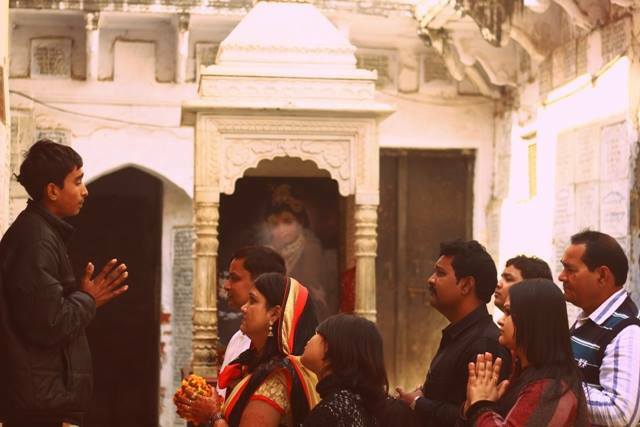 In the second, a young boy-turned-guide speaks to devotees at a temple.